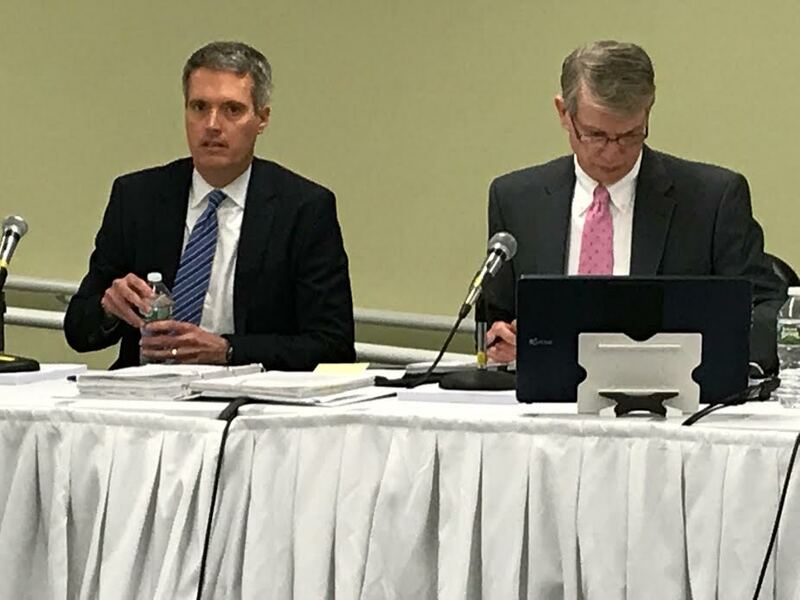 Michael Ausere, Eversource Vice President of Energy Planning and Economics, on the left, and Kenneth Bowes, Eversource Vice President of Engineering, testified before the Site Evaluation Committee hearing on the Northern Pass Transmission project Monday in Concord. CONCORD — In the current electricity market, Hydro-Quebec would not generate enough revenue to cover its costs during the first year the Northern Pass transmission project operates, Eversource officials told state regulators Monday. Additional expenses beyond the $1.6 billion estimate for the 192-mile transmission project from the Canadian border to Deerfield, would make the project economically unfeasible for Hydro-Quebec, said Kenneth Bowes, Eversource Vice President of Engineering during the third day of adjudicatory hearings before the Site Evaluation Committee. He said the electricity market has changed substantially since 2010 when the project was developed until today, due to the low cost of natural gas, which has reduced the price of electricity. “That is why the whole underground alternative is not cost effective for (Hydro-Quebec) to continue,” he said. The estimate to bury the line along the entire route is $2.6 billion. Currently, about 60 miles of the 192-mile route will be underground mostly through the White Mountain National Forest and areas entering and exiting the federally owned land. From Northern Pass’s inception through December 2016, Eversource has invested $190.5 million in development costs for Northern Pass including about $50 million for land purchases, Bowes told regulators. The development costs are included in the $1.6 billion estimate for the project that Northern Pass would recover from Hydro-Quebec under the Transmission Service Agreement between the two companies. Under the Transmission Service Agreement between Eversource and Hydro-Quebec, an Eversource subsidiary will finance, construct and own the transmission line, while Hydro-Quebec will pay to transport its energy to the New England electric grid. Bowes said while the revenues generated by selling the electricity on the wholesale market will not be sufficient to cover Hydro-Quebec’s obligation, the Canadian company has other alternatives to generate more revenue. He noted the two companies will bid to provide energy to the Massachusetts clean power initiative, a similar three-state program has yet to go out to bid, and the company could generate additional funding through the forward capacity market which pays generators to guarantee they will provide electricity three years in the future. Several days ago, Hydro-Quebec issued a press release saying it was exploring additional opportunities to sell energy in the New England market through connections in Maine and Vermont. “Beyond NPT (Northern Pass Transmission), there are other possible options for increasing exports to New England. Once the preliminary studies for Vermont and Maine have been completed, Hydro-Québec will further evaluate the merits of these options,” the press release stated. Under questioning from intervenors, Bowes and Michael Ausere, Eversource Vice President for Energy Planning and Economics, said the Northern Pass agreement does not exclude using other transmission systems to bring Hydro-Quebec energy into New England. While the project is under construction, Eversource would receive a rate of return on its investment of 12.56 percent and that would decrease to 11.75 percent once project is operational. Also during Monday’s hearing, attorney Thomas Pappas, counsel for the public, questioned if a more binding guarantee to pay for decommissioning the transmission line at the end of the 40-year agreement is available. He suggested a letter-of-credit or a surety bond from a bank or insurance company would be more secure than the financial arrangement for the project’s decommissioning fund. Currently the money for the decommissioning fund would be collected from Hydro-Quebec in the last four years of the agreement. Eversource spokesman Martin Murray said decommissioning costs are projected to be about $100,000. That is when Eversource would step in to cover those costs, Austere said, but Pappas noted Eversource is under no obligation to do so. The Site Evaluation Committee is expected to make a final decision on the project in September and Eversource officials said it will take between two and three years to construct the project. Ausere and Bowes are expected to continue answering questions from intervenors Tuesday. A public health panel will follow Austere and Bowes in Tuesday’s hearing. Garry Rayno can be reached at garry.rayno@yahoo.com. Day 1: William Quinlan’s testimony before the state Site Evaluation Committee hearing Northern Pass’ application.